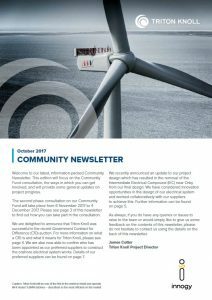 In case you missed it, the latest Triton Knoll Community Newsletter, which has been circulated to over 8000 local homes, is also available to view online from our website. This latest edition informs about the Community Fund consultation exercise and invites you to take part. For online visitors to Triton Knoll, you can also take part in the consultation online, but going to our consultation page. Consultation runs from 6 November to 4 December 2017.